Did you know that as much as a short walk from the train to work can cause incidental sun exposure? And that in Summer UVB rays can cause a fair skinned person to burn in as little as 15 minutes! Scary. Also considering I'm one of those fair skinned girls who burns very easily! In my teens I didn't pay much attention to sun protection but now I really try to apply suncreens and the like. UV rays can harm your skin no matter the season and it's SO super important to protect your skin all year round. Over a long period, incidental exposure to the sun can have devastating effects on the skin such as skin cancers, sunburn, premature aging and wrinkling of the skin. 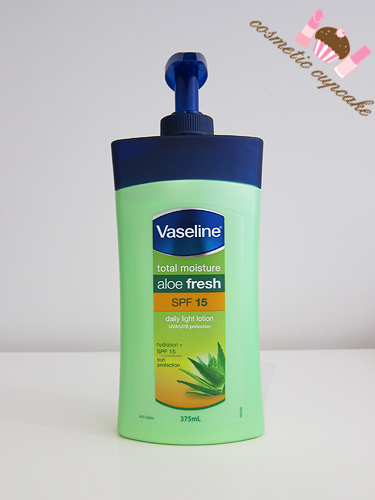 "Vaseline Aloe Fresh Lotion with SPF 15 is a light, quick absorbing moisturising body lotion enriched with moisturising Aloe Vera, blocking more than 93% of UVA & UVB and leaving skin silky smooth and hydrated. Apply regularly in all seasons for best results." I've been using Vaseline products for years and years so I was very excited to hear about this inclusion to their body lotion line. The SPF factor alone had me interested! 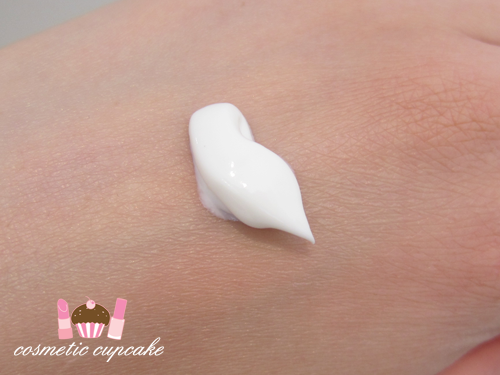 The lotion is white with a medium consistency and applies wonderfully. It sinks in to the skin pretty much immediately leaving no sticky residue and it feels hydrating. One of the things I absolutely detest in a body lotion is if it's sticky! 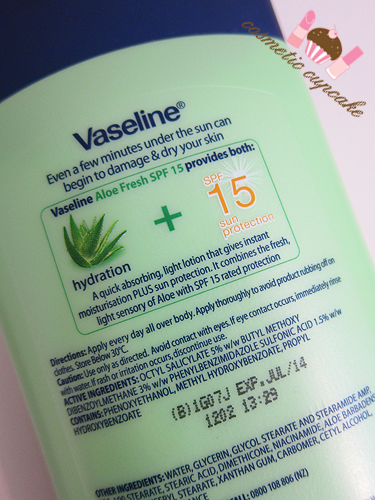 I had no issues with Aloe Fresh Lotion with SPF 15 which is what I find with other Vaseline body lotions I've tried before (why I love using them!). The lotion doesn't smell like sunscreen like at all and has a light aloe vera scent. Details: Vaseline Aloe Fresh Lotion with SPF 15 can be purchased now from supermarkets and pharmacies nationwide starting from a low price of $7.68 for a 200ml bottle. The 375ml bottle I've featured retails for $11.59. For stockist info, please call 1800 061 027. On to the event! This week, Vaseline Skin Saver squads will be out in force in city locations in Sydney, Melbourne and Brisbane to help protect us Aussie ladies this Summer! The very buff (AND SHIRTLESS!!!) male squad will be out in force with umbrellas and full size bottles of Vaseline Aloe Fresh Lotion with SPF 15 to help protect Aussie skin. The first 200 Sydney ladies who head down to Wynyard Park on the day will score a free coffee from the delicious Bertoni Café on Kent Street! If you're in the area on the day make sure you pop by. I wish I could go but unfortunately I'm working doh! The lovely Ms Kate Ritchie with the Vaseline Skin Saver squad! When: Wednesday 16th of November in Brisbane; Thursday 17th of November in Sydney and Friday 18th of November in Melbourne. Location:: Brisbane at King George Square; Sydney at Wynyard Park and Melbourne at Southern Cross Station. Edit 18/11/11: Please note that the Melbourne Skin Savers event has had to be postponed today due to unforeseen circumstances. Now for ladies who can't make it down on the day, no need to worry! 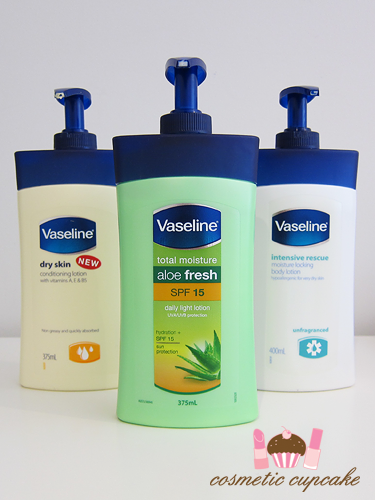 Vaseline have very kindly offered 5 375ml bottles of Aloe Fresh lotion in SPF 15 (pictured below) to give away to 5 of my lucky Aussie readers!! How awesome is that! How to enter: Simply be a public follower of Cosmetic Cupcake via GFC and leave me a comment below with your email address, what state or territory you reside in, and your no.1 sun protection tip. It can be anything! You can earn an extra entry by tweeting about my giveaway with link to this post. Don't forget to @cosmeticcupcake! Please note this giveaway is open to Australian residents only. Giveaway will end in just under a week on Sunday 20th November 2011 at 10pm EST. yay! ive been hearing ads on this alot on the radio. wear sunscreen even when it's cloudy!! and always bring a big wide brimmed sun hat to the beach! stylish AND protects you from the sun!! I need one of these! You can never have too much SPF! My email address is kimberleyjgriffiths@gmail.com, from WA. My tip is simple, wear a broad spectrum sunscreen underneath your makeup every day! Also, remember to apply on to the back of your hands when driving! Sun tip: Wearing sunscreen daily! tip: i'm lazy so i try to buy and use products that have spf as well. Tip :: When applying your daily facial sunscreen - always remember to apply some behind you ears. I've been sun-burnt there a couple of times and it makes it super painful to sleep at night. Always use sunscreen on the backs of your hands (as well as everywhere else), they are one of the first places to show aging and sun damage. My best sun protection tip would be more about minimising complaints from the boyfriend than protecting yourself from skin damage... Try to cover your forgetful significant other in sunscreen when you're protecting yourself. They'll thank you someday! my tip: always put on sunscreen even if it seems like the sun isn't shining too strong. Don't forget your hair can get sunburnt too. And always wear sunnies. Sight is precious.